Home • News • Movies • Does Anyone Else Confuse Kurt Russell with Patrick Swayze? Eric thinks I’m crazy but I get Kurt Russell and Patrick Swayze confused all the time. I feel like in the 80’s these two could have been brothers. Every movie they both wore the same super-tight, acid-washed jeans with the tucked-in sleeveless t-shirt and the overgrown mullet. Go back and watch “Road House” and “Big Trouble in Little China” and tell me I’m not right. Me feels same way my guy. Them bros looks like same person. When’s I finded our that Patrick Swayze wasn’t in the movie Overboard, me mind was blown. Me mama thinks I bee cray cray, but’s lucky I have you bros on me side. I definitely get them confused … all the time. I’ve thought for years P Swayze was the star of Big Trouble in Little China, I’m really bummed out right now..!!! I just got upset when my buddy told me Kurt Russel is the star of Overboard, not P Swayze..
Kurt russell and jeff bridges totally look alike… after aging they are becoming mirror images of each other. 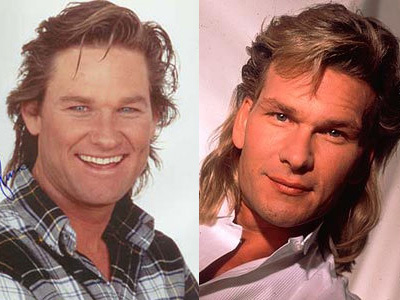 patrick swayze looked like kurt in his younger days. but kurt and jeff look same even when young and now even after getting old. They’re not the same person? I have always confused Kurt Russel and Patrick Swazey also Kurt with Jeff Bridges,nice to know I’m not alone!RIP Patrick Swazey ,you were my favorite. I am so ashamed of myself! This is absolutely unforgivable, but I did confuse my two favorite actors. I apologize! Maybe it’s because I am old and almost insane! Im sorry, but I thought Kurt Russel was dead from cancer. I just thought it was Kurt Russell and not Swayze dancing in Dirty Dancing. On the other hand Russell Crowe appeared in Gladiator from 2000. I don’t get it. They look nothing alike to me. Patrick was so much more handsome than Russell. Watched Dirty Dancing for the umpteenth time a few days ago; today Kurt Russell is on The View. I still feel like they’re the same person! A friend just posted a pic on Facebook of Patrick on a horse & I thought it was Kurt. When it said RIP I thought oh no another great actor gone. both are litle almost alike brothers it must be very dificult to tell if which is one of KURT OR PATRICK their face is almost perfect not over 100 percent just awesome ! I have the same problem and people think im crazy but obviously there is a similarity or there wouldn’t be so many people having rhe same problem. just watched tombstone and through I thought it was swayze then at the end noticed his name in the credits, turned out to be kurt I had to google to see if anyone else has had this trouble…and here I am now! yes i most definately have to agree!!! i only discovered this the other night when i watched a film with kurt russel and thought it was patrick swayze!!! I couldn’t agree more. I always get these two guys confused!! When I mentioned this to my brother a few years ago he looked at me like I was crazy. I’m glad I’m not the only one. Yeah, I am the same; just finished watching a movie called ‘Dreamer’ starring Kurt Russell and all the way through the movie thought “what a shame he had to die so young”, but of course, it is Patrick Swayze who died. They are not identical, but nonetheless have many facial features that are the same. RIP Patrick, you gorgeous hunk!